Miguel Cabrera was one of the most celebrated and prolific artists of viceregal Mexico in the eighteenth century—painting everything from casta paintings and portraits to large-scale religious altarpieces and small devotional paintings. During his lifetime, he achieved great renown, and even attempted to create an official Academy of Painting in Mexico City modeled after the Royal Academy of Fine Arts of San Fernando in Madrid. 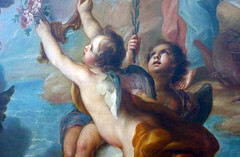 On his 1760 painting, The Virgin of the Apocalypse (above), Cabrera notably signed his name as “Michelangelo” (left) to draw comparisons between himself and the great Italian Renaissance master and to promote the idea that he was the Michelangelo of Mexico. Even beyond the signature—which links the art of New Spain to the European tradition—this painting reveals other artistic and religious exchanges between the Spanish viceroyalty (in what was known as the “new world”) and parts of Europe. The iconography of Cabrera’s The Virgin of the Apocalypse derives from chapter 12 of the Book of Revelation—a book of the New Testament that prophesies and describes the end of the world and the second coming of Christ. This comes as no surprise since subjects related to the apocalypse (the end of the world) and the Virgin Mary were increasingly important from the late seventeenth century onwards in New Spain. In chapter 12, John of Patmos, the author, describes a woman “clothed with the sun” and pursued by a dragon who wants to devour her child. 1 A great sign appeared in the sky, a woman clothed with the sun, with the moon under her feet, and on her head a crown of twelve stars. 2 She was with child and wailed aloud in pain as she labored to give birth. 3 Then another sign appeared in the sky; it was a huge red dragon, with seven heads and ten horns, and on its heads were seven diadems. 4 Its tail swept away a third of the stars in the sky and hurled them down to the earth. 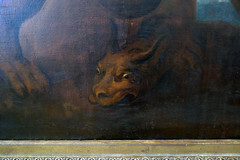 Then the dragon stood before the woman about to give birth, to devour her child when she gave birth. 5 She gave birth to a son, a male child, destined to rule all the nations with an iron rod. Her child was caught up to God and his throne. 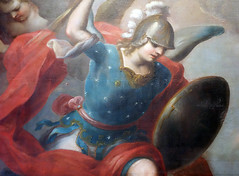 The rest of the chapter describes how “war broke out in heaven” and how the archangel Michael and his angels fought the dragon who fled with the wings of an eagle. The representation of the Woman of the Apocalypse in Baroque art included recognizable Marian iconography deriving from the Litany of Loreto (also known as the Litany of the Blessed Virgin Mary), approved by Pope Sixtus V in 1587 (a litany is a call and response form of prayer). 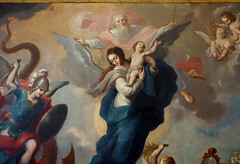 The Woman of the Apocalypse is often dressed in the Virgin Mary’s colors—either blue and red or white and blue as seen here. 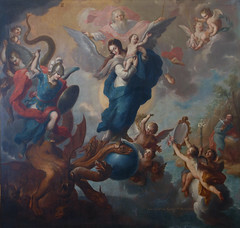 The white and blue color scheme corresponds to the iconography of the Immaculate Conception (the doctrine that Mary was conceived without original sin in her mother’s womb)—a popular subject in Spanish Baroque art (examples here). 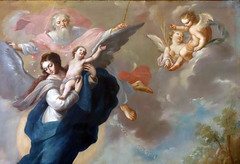 In his treatise entitled El arte de la pintura (The Art of Painting, 1649), the Spanish painter and theorist Francisco Pacheco offered guidelines as to how the Immaculate Conception should be represented, proposing that painters depict Mary wearing a white tunic with a blue mantle and stars around her head—all motifs derived from the Book of Revelation. In Cabrera’s painting we see a literal representation of the heavenly battle described in the Book of Revelation. At the center of the composition a woman stands in front of the sun, dressed in a white tunic and a blue cloak (the white shawl with blue stripes draped over her shoulder resembles a tallit (a Jewish prayer shawl). She stands over a blue orb and steps on one of the dragon’s seven heads. Like the woman in Revelation, she has two wings and twelve stars around her head. She holds aloft a young boy who is reaching up to God the Father. God, clothed in red and white, is identifiable by the traditional long white beard and triangular halo that symbolizes the Holy Trinity. God is painted somewhat fainter than the woman to indicate that he is behind her. 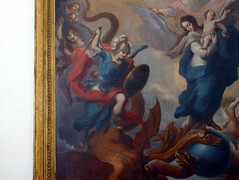 His arms are outstretched over her wings, implying divine assistance as she triumphs over the dragon. The heavenly battle unfolds to the viewer’s left; St. Michael and his army of angels come down from heaven. Like the woman, Michael has one foot on the dragon, as he casts the monster down into a fiery, demon-filled hell on the lower left. In the top right clouds (image left), one angel bears a palm frond (a traditional symbol of victory) as the other looks down while also pointing to God. The angels at the lower right hold a mirror and small bouquet of roses referencing symbols in the Litany of Loreto. 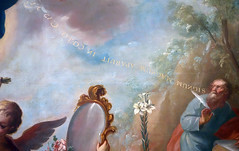 The mirror stands for the Virgin Mary’s title of speculum justitiaé (mirror of justice); the roses are for her title of Rosa mystica (mystical rose). Another angel holds a lilies (a symbol of purity); the rose and the lily are flowers often included in depictions of the Virgin Mary. Both are mentioned in a passage from the Song of Songs (part of the Hebrew Bible) often associated with the Virgin, that reads “I am the Rose of Sharon, the lily of the valleys” (2:1). Off in the distance on the right side is John, the writer of the Book of Revelation. He sits outdoors recording his vision; he looks to the sky and the words from his prophecy, signum magnum apparuit in caelo c. 12 (and a great sign appeared in the sky, Ch. 12) come forth from his mouth written upside down—perhaps an indication that their real author was in heaven. 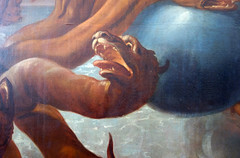 The woman crushing the head of the serpent in Cabrera’s painting symbolizes the defeat of heresy. But another interpretation is possible. Many Mesoamerican cultures venerated a feathered serpent deity (Quetzalcoatl for the Aztecs), and in the wake of Spanish colonization—beginning after the defeat of the Aztecs in 1521—there were many attempts to eradicate the traditional beliefs of the indigenous people as they were being converted to Christianity. 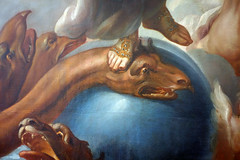 The image of the woman of the apocalypse crushing the serpent could be therefore also interpreted as Christianity defeating indigenous Mesoamerican religious beliefs. The format and iconography of Cabrera’s Woman of the Apocalypse is borrowed from the Flemish painter Peter Paul Rubens’ work of the same subject (above, right). Rubens lived in Antwerp (then part of the Spanish Netherlands). Skilled in both art and diplomacy, he was employed by the Spanish crown in both capacities. King Philip IV of Spain was one of Rubens’ patrons and thus his work was highly regarded and widely reproduced through prints. These prints made their way to the Spanish Americas where they influenced local artists. One artist, Cristóbal de Villalpando created a large version of the Woman of the Apocalypse between 1684–88 for the sacristy of the Metropolitan Cathedral of Mexico City. Other Mexican painters, including José de Ibarra (Pinacoteca Profesa, Mexico) and Miguel Vallejo (Museo Regional de Querétaro), also painted their own versions of the Woman of the Apocalypse prior to Cabrera, demonstrating the subject’s popularity in the Spanish viceroyalty. 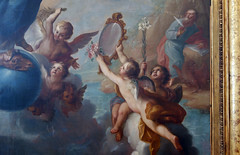 Cabrera’s style has been likened to the work of Spanish artist Bartolomé Esteban Murillo as well as Rubens, though his style is softer and more delicate. Rubens’s painting of this subject is more energetic and has a vertical emphasis (where the Cabrera is more square in format). In the Rubens, the viewer clearly sees a landscape and a tumultuous battle in the sky that curves around the central figure of the Woman/Virgin Mary. 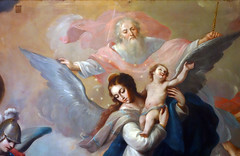 Most of the iconography and its placement remains the same in Cabrera’s work, though Mary does not wear red—instead Cabrera follows Pacheco’s suggestion of white and blue clothing. Cabrera and his workshop produced many secular and religious artworks. For instance, he made numerous versions of Our Lady of Guadalupe—a miraculous image of the Virgin Mary who appeared to an indigenous man (Juan Diego) in Mexico in 1531. Significantly, the Woman of the Apocalypse, the Virgin of the Immaculate Conception, and Our Lady of Guadalupe all share similar iconographic details such as stars, the moon under her feet, being “clothed with the sun,” and crushing a serpent. Our Lady of Guadalupe was often interpreted as the Woman of the Apocalypse by contemporary Mexican writers including Miguel Sánchez and Jerónimo de Valladolid. This was an important identification because it associated Juan Diego with John of Patmos, the author of the Book of Revelation. Our Lady of Guadalupe is further linked to the Immaculate Conception by the proximity of their Holy Days: Guadalupe is celebrated on December 12 and the Solemnity of the Immaculate Conception on December 8, though it was celebrated on December 9 in Mexico—the day the Virgin first appeared to Juan Diego. Miguel Cabrera even wrote a short treatise entitled Maravilla americana (American Marvel, 1756) on the miraculous nature of the image of Our Lady of Guadalupe from an artist’s point of view. The prominence of the apocalyptic iconography of the Woman of Apocalypse is thus linked to other important Marian apparitions and advocations in colonial Mexico at a moment in time when many elite creoles (pure-blooded Spaniards born in the Americas) were championing their local identities and the greatness of New Spain. Miguel Cabrera’s painting was commissioned by the elite creole patrons, Don José Reaño and his wife Doña Maria Olivares, indicated by an inscription at the bottom of the painting, A la Devoción de Don José Reaño y Doña María Olivares, su esposa [To the devotion of Don José Reaño and Doña Maria Olivares, his wife]. 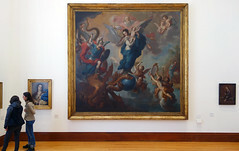 Unlike Rubens’ painting, which was meant as a cathedral altarpiece, this painting was displayed at the Royal and Pontifical University of Mexico. The University (the first in the Americas) was founded in 1551 by Friar Juan de Zumárraga, first bishop of Mexico, and Viceroy Antonio de Mendoza. The university was established “to serve God and the public welfare.” In 1557 a decree was issued that limited the number of students of “mixed blood” (those with Spanish and indigenous parentage) to six and in the 17th century, essentially only those of Spanish descent were admitted. The painting was later moved to the San Carlos Academy of Fine Arts, then to the San Diego Viceregal Painting Gallery and finally the Museo Nacional de Arte (MUNAL), where it is housed today. *Much of the symbolism in Revelation is drawn from the Old Testament, specifically from the book of Genesis. The twelve stars, the sun and moon refer to Jacob and the twelve patriarchs (twelve tribes of Israel). The twelve apostles of Christ parallel the tribes and the Christian community is considered the New Israel. Philip Russell, The Essential History of Mexico: From Pre-Conquest to Present (Routledge, 2015), p. 88. Cite this page as: Dr. Melisa Palermo, "Miguel Cabrera, Virgin of the Apocalypse," in Smarthistory, August 27, 2016, accessed April 21, 2019, https://smarthistory.org/cabrera-apocalypse/.